Made of tough, durable, 200# test, "B" flute corrugated, oyster white one side. Bin boxes can be oil-shield treated upon request. In stock for immediate delivery. Economically priced bins for fastener and small parts storage. Note: These are non-stock. Allow 7 days to ship. 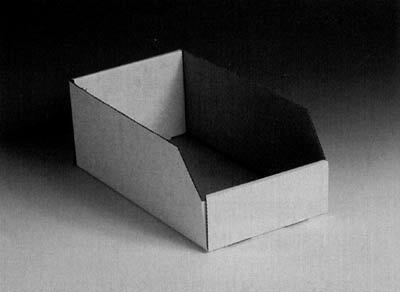 If you do not need the small 4" x 6" x 3" or the 4-1/2" choose our Standard Bin Boxes instead. **Stock left over from previous special jobs. Prices good while inventory of this item lasts. Additional quantities priced per order.